The aides of MP Parasyuk detained. A police officer had to make warning shots into the air to stop a convoy of vehicles that was moving at high speed, the Interior Ministry press center reported on 15 March. "At around 22:00 [on Monday], police officers had to stop a convoy of vehicles transporting unidentified individuals. The convoy has previously broken through the Slavyansk roadblock having injured police officers. The convoy did not react to the police demands to stop, so a police officer had to make several warning shots in the air in order to protect the life and health of the police. The convoy was moving at high speed," the police report reads. Among the detained individuals was people's deputy Volodymyr Parasyuk, who, according to previous statements, has been hospitalized. Parasyuk has confirmed the fact of detainment and use of weapons against the supporters of the blockade, who were heading to Bakhmut. "They have just opened fire on us," he wrote on Facebook Monday night. 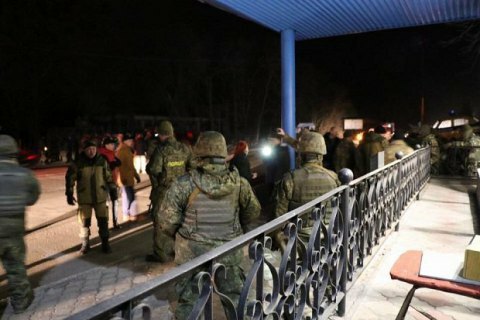 The assistants of the people's deputy Parasyuk have been detained and taken into custody in the Kramatorsk police department. The reasons for the detention do not explain. Donetsk police asked the Prosecutor General's Office to assess the actions of MP Parasyuk, under whose leadership Slavyansk police officers were attacked by about 40-45 protesters. During the scuffle, seven police officers were reportedly injured. One officer of the special police squad, who was run down by Parasyuk car, was rushed a local hospital. Parasyuk's supporters said that the National Guards used tear gas against them during the skirmish.